Imagine that you are out meeting a client and this time, instead of being confined to the use of your laptop, you are able to turn any surface which you deem fit, into a large interactive screen for your sales presentation. Or, imagine lying in bed and enjoying a late night movie as it is being projected onto your bedroom ceiling. 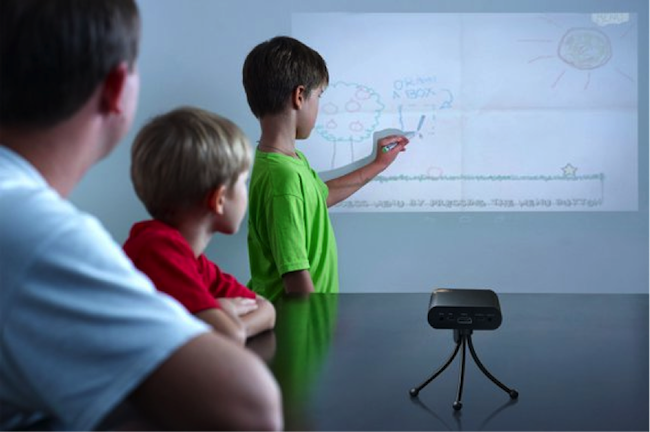 All of this is now possible with a portable handheld gadget called TouchPico, which is an Android PC offering the combined experience of a desktop, mobile device, and projector. With the TouchPico, you can now turn any surface into an interactive 80-inch touchscreen and enjoy streaming your applications from the TouchPico onto the big screen. For a full interactive experience, the TouchPico comes equipped with an infrared stylus, offering pinpoint accuracy and functions like a giant smartphone touchscreen, simply by touching the stylus to the projected images. The first TouchPico product projects a brightness of 80 lumens but the team behind the product is working towards the development of the TouchPico Pro. 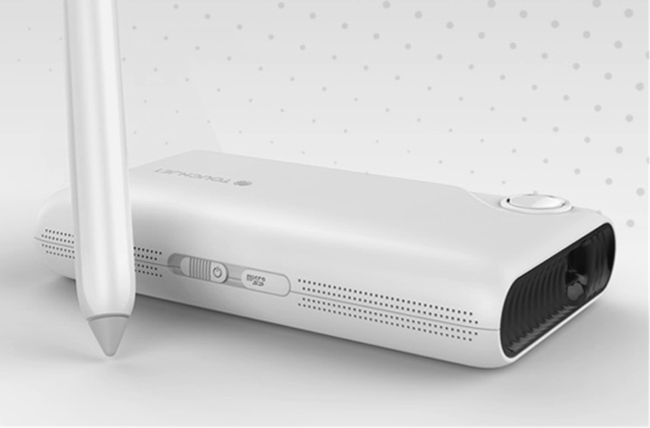 With the brightness of 400 lumens, the TouchPico Pro would be good enough to light up a classroom. The gadget, which is about the size of a Samsung S4 phone, is also fully compatible with all Apple MacBook and PC laptops. The team behind TouchPico is TouchJet, which was founded by Tom Li Jiang – an alumni from Singapore’s Nanyang Technological University (NTU) who specializes in Computer Vision. TouchJet is made up of a diverse international team, including Singaporean, Russian, New Zealander, American, and Chinese team members. Founded in Singapore, TouchJet also operates from the US and China. “Our co-founders thought that TouchPico is a cool idea and we come from various technical backgrounds, so we decided to run a startup and develop TouchPico,” Tom said. According to him, current mobile devices seem to have two limitations. One is the limitation of screen size and the other is intuitive input method. With TouchPico, Tom hopes to provide a solution for future mobile devices and eventually release different TouchPico products catering to personal, business and educational uses. So far, TouchPico seems to have been a hit with early adopters. A versatile gadget that would potentially cater to a wide audience, TouchPico has launched a successful crowdfunding campaign on Indiegogo, receiving USD$500,000 worth of pre-orders within the first 15 days. “ People are starting to get bored with the iPad and smartphone. TouchPico’s biggest value-add is that it works as a giant touch display for mobile devices,” Tom added. Web developers have also been encouraged to develop family-friendly and educational apps for the TouchPico. For those who take up the TouchPico developers’ pledge, they will receive a TouchPico to kickstart app development and eventually secure app installation on all TouchPico devices ordered in 2014. One of TouchPico’s goals is also to make the whiteboard experience widely accessible to all teachers in the world. “We love to devote our time to the TouchPico Community Program. Currently, we are developing the TouchPico Pro, which is a low cost all-in-one teaching tool. To promote this community program, we will work closely with various education partners,” he said. Following a successful campaign on Indiegogo, the team has kicked off mass production of TouchPico and hopes to release a new product by 2015. Check Out These Successful Kickstarters From Malaysia! This article is written by Colleen Yap.